A how-to guide on fixing your Volvo 850's broken odometer. The run-down below shows how to replace your odometer's gear wheel to get it back up and running. How many miles do you have on your Volvo? Don’t know? Have no way of knowing? Maybe it’s time to fix the odometer! 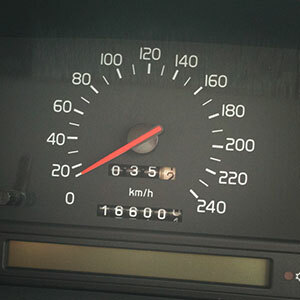 We’ve got a detailed how-to guide on fixing your Volvo 850’s broken odometer. Check out the run-down below to see how to replace your odometer’s gear wheel (if a tooth is broken, for instance) to get it back up and running. If you have a Volvo with an OBD system under the hood (generally up to 1995 and some ’96 models), you can read the actual miles from the ECU so that you can set your odometer to the correct number after it’s fixed. Follow the detailed steps below to fix your 850’s odometer! IMPORTANT NOTE: MVS user Steven reports this impacts both the trip meter and odometer. Remove vents to access inner fastenings. Remove screws around the dash. Remove the instrument cluster by loosening the dash above the cluster, unplugging wires, and opening the latches holding the cluster in. There are many detailed photos, so take your time to go through them! Remove the back of the instrument cluster. Remove the faceplate. 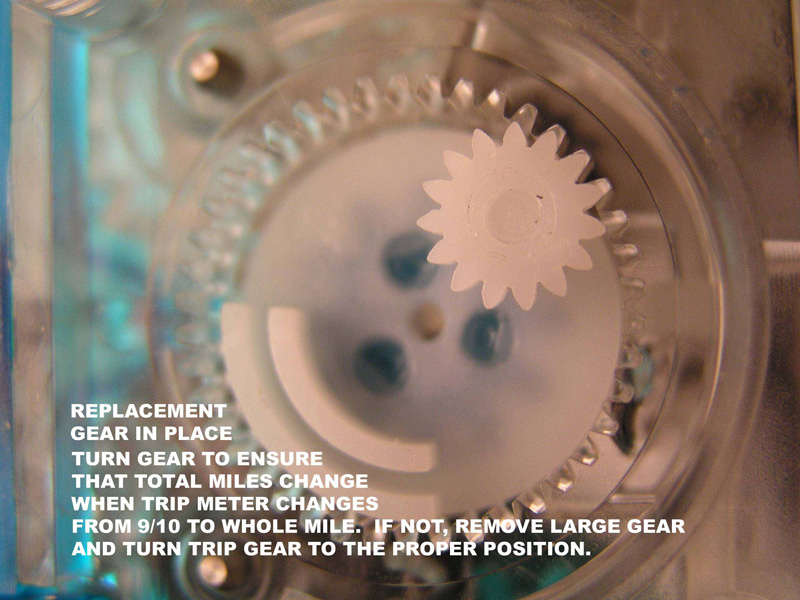 IMPORTANT TIP NOT SHOWN: There is a brass nut and washer on the back of the cluster that must be removed before you can gain access to the odometer and trip gears. Do not tighten too much after the repair as you can crack the circuit board. 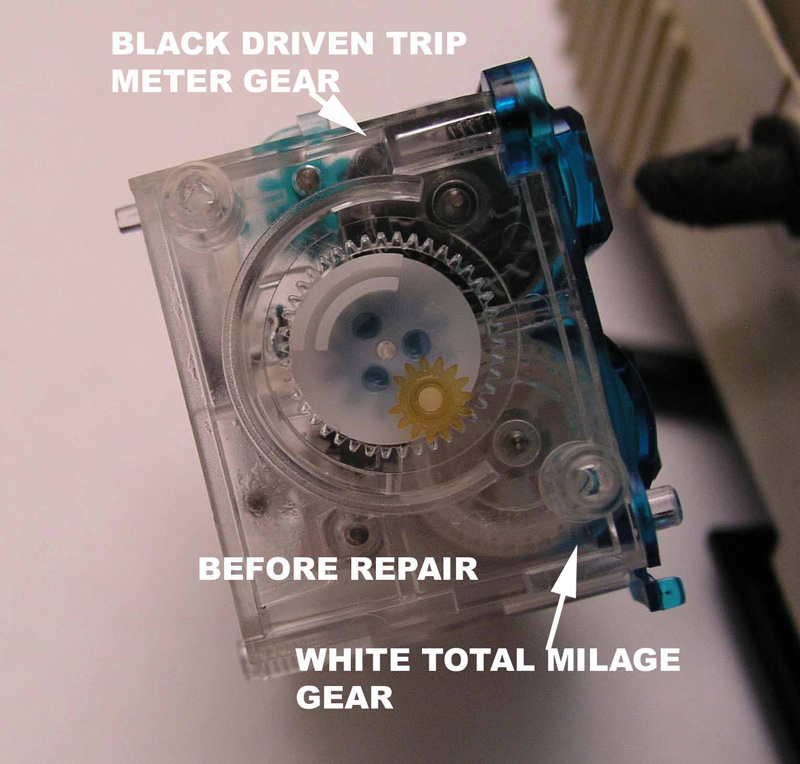 Remove the odometer’s gear unit (in blue in the photo below). Unscrew the wheel section from the removed unit. Remove the broken wheel from the wheel section. This broken wheel is what we are replacing! Install the new wheel in the wheel section and re-install the wheel section onto the larger, blue gear unit. Nice! We’ve completed our quest. Now it’s time to just put everything everything back. First, reinstall the blue gear unit into the instrument cluster. Test the unit to ensure everything is working properly. The rest is easy! Pop the face of the instrument cluster back on, replace the screws on the back (don’t forget that brass screw! ), and reinstall the instrument cluster into the dash. 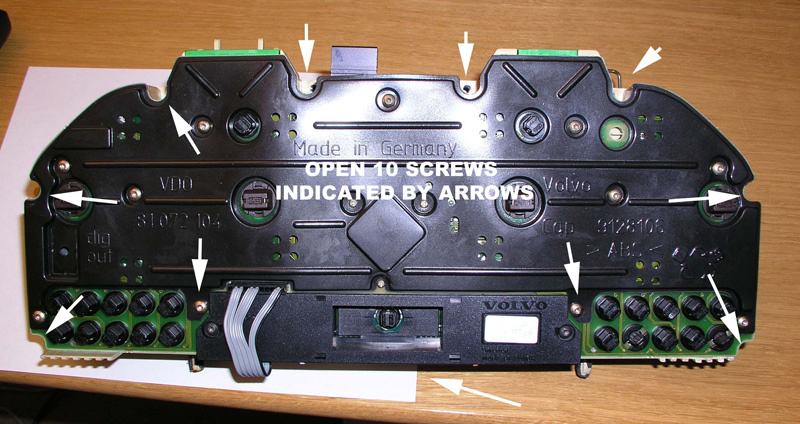 A detailed how-to guide on fixing your Volvo 850's broken odometer. The run-down below shows how to replace your odometer's gear wheel to get it back up and running. Where can I buy one of those gears for my odometer. http://www.odometergears.com/ or any of this site’s sponsors. Just finished this repair and it went very well. I don’t think I quite aligned the RPM needle, though… ah well. Just be extra careful with that step. ok so I just finished this repair and it went very well. The repair itself took maybe 1 to 1 1/2 hour to do. That is from the removal of the first screw to replacing the last one. I took the time to clean the vents and do some touch up since the dash was appart. My ’94 850 is a little different from the pictures but if you have any idea on what you are doing the pictures will help out alot. there are hidden screws behind the vents you need to get too. to do so just lift the vent from the bottom till the snap ring things let go. NOW, as for the gear it was so easy to replace. The pictures on the page were a great help. Thank you for the gear and help. this sounds pretty good. i am going to try it. just one question: would this be a good time to replace the dashboard lights? are they easily accesible during any of the steps in this repair? My 97 850 had 3 screws holding in the odometer gearbox and they took the next smaller torx than I had in my set- pretty small. So I used needle nose to turn them in and out. Also there was a 4 pin plug on the gearbox to the circuit board, and it was not clear how to detach it but all you do is pull out the gearbox. The plug is odd- looks flimsy but it comes out OK.
And the vent removal is not all that clear for the newby like me. I ended up rotating it down, then only one side would come out fairly easily- the left on the left, middle, and rt on 3rd one. And the little button plastic screw cover on left side of dash just prys out with small screwdriver. Also discovered the check engine, service lamp and traction control lamps were removed. May want to have some on hand- I didn’t and found only one unused and put it in the ck engine. Re the brass nut, this is the back of the boot pressure gauge in the T5 – I managed to pull the rubber hose connected to this out with the instrument cluster. I found it push fits over a hard plastic hose, but had to remove the kick panel below the steering wheel to get access to it. Even with this unexpected hassle, still only took about 1.5 hrs all up, great article. This is great. I bought the gear online because mine just gave and the seller of the part referred me to this site for information on how to install the gear and also other repair tips for my Volvo. Great stuff! Just completed the repair and everything works great. Thanks alot for posting this…saved me a lot of money. One note: on my ’97 850, there was no brass nut on the back of the cluster, and I got the cluster out simply by removing the plug. Is there any way I can check the true mileage on my ’97 850 glt or is too late of a model? Thanks again, I owe you one. Check ebay. $12, free shipping. Works fine. One note, the 3 small Torx screws holding the odometer onto the instrument panel are a size T8, so be sure to grab this tool before taking the car apart. So, The tutorial actually works well even for a later model 97 turbo. Be sure to remove the brass nut behind the turbo gauge before you start trying to pry the instrument cluster apart. I didn’t and popped the turbo needle right off the spindle. Also “blue unit” of my odometer is not connected via a plug and wire. The “blue unit” sits right on thin prongs from the back. As a relative amateur, I found this site to fix my 94 850 odometer. I followed the instructions, step by step, and to my amazement, IT WORKED. The only part that I forgot was to read the “real” mileage BEFORE I took the assembly out of the car. I then had to reassemble everything, read the true mileage, disassemble, fix the mileage and then reassemble. I gotta say, I know how to do it now, having done it twice within the same repair. THANK YOU VERY MUCH for such a detailed and illustrated website. This tutorial is excellent, and worked for me. The author must have designed the Volvo odometer to know about the tiny gear that wears out. Used another tutorial on “dash removal” which helped getting the vents out — never know when to force snap/press fits for fear of breaking something. Thanks a bunch. Many thanks. This worked just fine, I did however have a hard time getting the dash quite right afterward. I hope to get some advice on the forums about that. I have a 1995 wagon 850 and have been trying to remove the dash so as to get to the panel and odometer gear. The problem I’m having is the right side of the dash won’t unfasten and I can’t figure out where and how it’s fastened. There’s a passenger side airbag there but no instructions on how to remove a dash with an airbag. Can someone help me with this problem? Is there another set of instructions for this? There are 4 10mm bolts under the airbag behind the glove box. Take those out, un hook the airbag connector (DISCONNECT battery first!). There are also 2 more torx screws at the far right vent on side of dash and 1 under right dash speaker cover. At the airbag lift front of dash up and pull out to unseat the back lip of the dash. Do not lift back up first or you will crack the black trim near the window. Thanks! Your pics were a huge help. The only thing I didn’t see was how to adjust the odometer if you know the correct mileage. (maybe you don’t) Other than that it was a piece of cake. Thanks for the odometer fix tutorial. I have a T-5 and had the same problem Shane had with the turbo hose. I followed his directions and everything worked fine. However, I have to reset the turbo needle since it would fall off when replacing the whole cluster. I ended up puting a small amount of gorilla glue around the top edge to keep it in place while re-installing the cluster. Thanks, I could not have done it without this site. I just wanted to say that I repaired my odometer. The tutorial that you provided on the website was very helpful. It took me about a hour to remove it and make the repair and about a half hour to reinstall. I was very impressed with the overnight shipping as well. Keep in mind I am no mechanic and have limited skills with tools. I must say I am proud that I was able to do it myself. I went to a Volvo mechanic and he told me it would cost well over 400 dollars to do this job. I did it in a couple of hours for under 80 dollars. Thanks for all your help. While I didn’t match any of the installation times recorded by others here, I would not have been able to change the oodometer gear without the great help and pictures provided in this tutorial. I want to re-emphasize a couple of comments here and be sure you pay attention to the boost hose getting easily disconnected. If so, you’ll need to reconnect it by removing the kick panel under the steering wheel and finding the hose it was hooked to. Also, it’s unclear in the tutorial, but you don’t need to remove the screws in the black plastic panel covering the circuit board. Lastly, definitely use a towel to cover the dash when you remove the instrument cluster or you’ll scratch your clear plastic for sure. Thanks again for your excellent tutorials! This tutorial was extremely helpful in my repair of the odometer. Like others here, my ’97 base 850 does not have the brass nut on the back of the circuit board, and the odometer plug is hard mounted. Otherwise, the instructions were dead on. I would suggest replacing every service bulb (I have 14) and every dash light (4). The dash lights are standard and can be found in any auto parts store. The service bulbs can as well, but they come without the plastic bases. The bases need to be reused, and the wire leads of the new bulbs must be bent to that they make pressure contact against the metal blade leads within the bases. If this is too laborious, Volvo has the bulbs with the bases for purchase. As my odometer stopped working 15,000 miles ago, I also chose to open the odometer blue box to reset the mileage. I’d recommend this step only to people used to working with small plastic parts. The whole assembly can fall apart if one isn’t careful. However, I was successful. The only issue I had with the project was that the right side of the dash, just past the center vents and left of the recess for the glove box, was stretched so that it no longer sat flush against the vent frame. I chose to address this the easy way – by drilling a small hole and screwing the dashtop to the frame. I painted the screwhead to gray to match the dashtop. It’s all but unnoticeable. Many thanks to Matt and to everyone else here who has provided us with the benefit of his/her experiences. I want to thank everyone who posted all the great instructions and tips. I got the part over a year ago and have procrastinated all this time thinking it would be a bear to get it done. I finally got up the courage to do it today. Well, a few hours later and only one trip out for epoxy to fix a broken plastic clip brace, (my fault), and it works like a charm! The odometer stopped almost 40,500 miles ago and I did manage to use the code to find the true mileage and after looking at the unit, I found if you take the blue plastic panel off you can apply just a little pressure to the blue gears, and rotate the numbers to set the mileage. I did want to mention the hose for the turbo. Be careful to disconnect it from under the kick plate. The part where it plugs into the back panel is very brittle and might break. It’s amazing that a part as small as that can cause so much work. By the way, I lost the old one moments after taking it out. It’s down there somewhere. Just did this on my 97 850, Canadian version. I thought I would mention a little difference: unlike on the tutorial, instead of a wired connector there is a white plastic thing connected right into the board. It comes off easily with a flat screwdriver, but you shouldn’t pull straight on it. Also there was no brass nut and bolt on mine – is this only on the turbo gauge? Thanks for the great tutorial. I just finished this on my 97 850R. The brass bolt may or may not be there depending on if you’re turbocharged or not as it connects to the boost gauge. As well as having the plastic clip referred to by Phillipe (above) instead of the wire and blue plug, I had to remove 4 of the little torx screws running along the bottom of the black plastic to allow me to remove the dash cover. When reinstalling – I think I didnt push down on the white reconnector plug hard enough because I had to redo the entire thing when the odo didnt move on the next drive. Another thing to note – dont reconnect the battery and turn the ignition without reconnecting the passenger airbag. I did that and it tripped code 222 – leaving the SRS light on until it was cleared by a Volvo mechanic. Thanks again to the MVS contributors for another great fix. Did this on my ’95 850 GLT yesterday in a bank parking lot, as I live in an apartment and have no good place to work. No issues at all. Taking out the instrument panel was far easier than I expected it to be. I once took the heater fan out of a ’76 245DL in near-zero temperature. THAT was a b*tch. My odometer box was held on by three small Philips screws (not torx). popped the needles off carefully on placed them slightly below zero. then remove and align needles. This basic concept–the gears needing replacement due to broken teeth–works as well for my 1988 240–yet—after the replacement–the odo worked for .7 miles and then stopped. 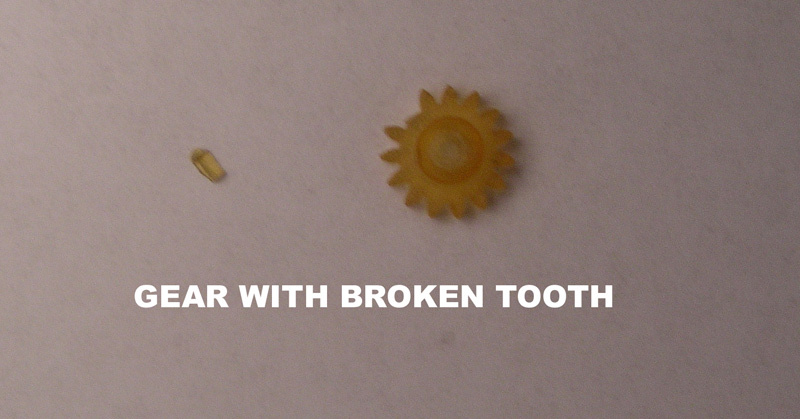 i took the unit out again, to check on the gears–all well–both of them–did a dry test with the small rubber shaft like piece that actually does the turning of the gear assembly–works fine–yet when reconnecting the wires and the entire unit reinstalled–NO GO! Any help out their Dear Volvo users?? Perhaps a fuse issue? or?? Did this today, instructions are well done. 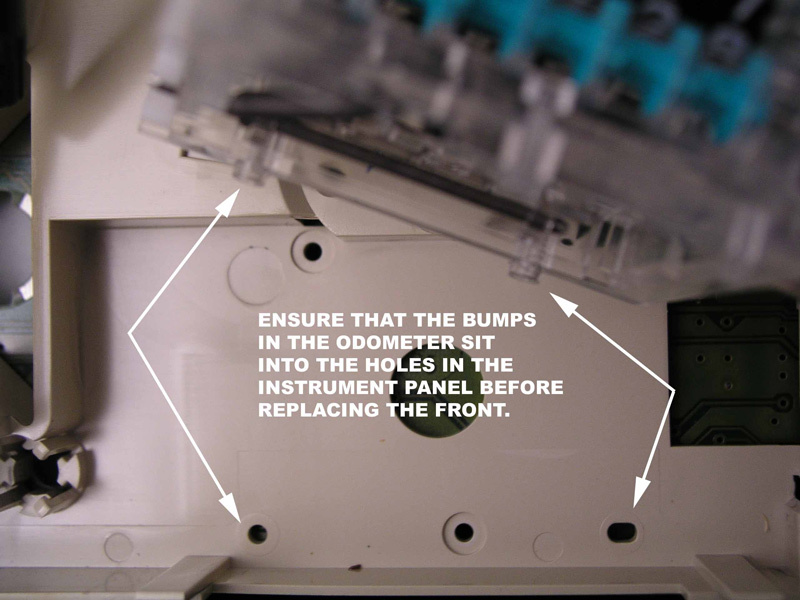 I would consider having the picture highlighting which screws to separate the panel top and bottom to the main portion of the guide. I bought the gears from ebay seller sommer2201. I replaced both vulnerable gears (the pod/15 tooth and the 12 tooth) for a total of $30. Saved some money over odometergears. Hey I know I am a couple years late on this, but I wanted to ask what about the speedometer id that what it called will it fix that too? How do you find out the “real” mileage ? I have a 95 850 and I own an obd2 reader and the vehicle does have the underhood diagnostic connectors. I read the whole thread where people did it and adjusted their odometers but no one in this thread said HOW they did it ! Finally found the instructions on reading actual mileage off the ECM. This set fo instructions for the gear replacement was right on point. I think I had an assembly that was a little less complicated so it only took me 45 minutes tops! Kudos for this website. Thank you, thank you…I am almost finished. Unfortunately, I didn’t keep track of which bulb goes where. Three of them say 4S and one says 3S. Which bulb goes where? Thank you for this!! Crazy that that TINY gear is the source. Photos and instructions were perfect. Much appreciated! It took me two attempts to finally get the gear repair completed. On closer inspection the second time around I noticed a small “injection projection” from the molding process left on my larger gear. I carefully smoothed this off with a nail file, reassembled the odometer and prayed for luck. SUCCESS! It works good and I got everything reassembled in good shape looking showroom fresh. I caution folks that this project requires a good level of mechanical ability or experience in “swiss watch repair.” This was not an easy project for me. I would rather have changed the brake pads than do this job. But, It’s done and I saved a ton of money. Thanks. That was a great lesson, now where can I get the little gear? I have a 94 850 Volvo wagon, where do I find the real total miles? please sent me an answer to my email. And Yes this was a good lesson, great pics, but I know I would not be able to do this. How long does this process take? I could give it the old college try, lol. I’m pretty good with small intricate things, but feel I will screw it up. Never done mechanical work. A variation to the above, I found that on my Volvo 850 when I got to step 23, the connection between the odometer unit and the back was differrent. There was not a cable, rather a fragile-looking while plastic rigid PCB-mounted angle connector. It was not obvious how to disconnect it without breaking it. However, the trick is to grab hold of the base of the white connector with a pair of needle nose pliers and gently pry it off the base mounting point. It should come off fairly easily. The angle connector comes out with the odometer. If something looks like it is bending or stretching *stop* because you are not pulling the right part. Grab it as low down as you can and gently wiggle it off the posts. Easy-peasy. Only thing I did not see was to remove the 3 tiny phillips head screws holding the mechanism in the housing. Also got to glue the magnet back on the dash speaker that I found resting inside the dash. An added bonus. total cost; 30 €, estimated price at the Volvo-dealer; 300 € minimum ! so thnx again for all the support. Grtz from Leuven, Belgium. Success! Thanks for the help. My 1997 850 had three T8 screws holding the odometer unit to the panel instead of a brass nut & washer. Also the connector was integrated into the unit & needed to be gently pried up off its connecting pins. Thanks a lot for this perfectly detailed manual. I see myself not at all as a mechanic, but I could follow every step/photo perfectly well. I have read on a different forum on this site that you cannot fix the odometer on a 88′ 240, just thought it wouldn’t hurt to ask if this fix would work for my 240. Although from what I remember the 240 doesn’t use a gear? Thanks a lot for the info. It worked fine, except in one detail. The rpm meter is “reading” 1000rpm below what it should and the indicator doesnt rest on 0, but below it. I already assemble it again, no pins were bent. Any suggestions ? Thanks in advance and congratulations for the site. Thank you very much for this great instruction. It worked perfectly! Best greetings from Berlin. Closeups of each step could be closer-in using pointer vs finger would make it clearer when described verbally. Great job. Thank you for the excellent description of all these working steps. It took me 4 hours to do the job, including a little ride to get the right screw driver in a tool shop. But everything works fine now. “The Volvo Guys” in Toronto, Ontario, can alleviate this meticulous and arduous process same day. They use a high speed gear with the highest quality and hardest material that will simply never break again, by far better than the original. Sure beats ruining an expensive cluster. They do great work, amazing guys. Thank you SO much! Had it not been for this guide, I wouldnt even have tried. All in all it took me two hours of work using four screwdriver bits (TX8, TX 10, TX20, Ph 1) plus a small straight screwdriver for the vents. Only difference in my car (-96 GLT) was step 25-26: there was no red cable but a four-in-one connector to gently pry vertically. Again, THANKS. Love the interwebz. Ordered the gear already this summer and it has been sitting on my desk until now. Expected to use a whole day for the repair and dit not have the time until now. Spent only an hour and a half on the whole ting and managed to cange the broken lightbulbs for “right turn” and “Tracking” as well. Thank you so much for a super thorough walkthroug!